6/28/14 This post is being re-issued since additional information is now available. Dates: July 11, to November 2, 2014. Reception July 11, 7:00 PM. Entries for the competition will be shown in a gallery adjacent to the main exhibition. Catalog: A catalog will be available. 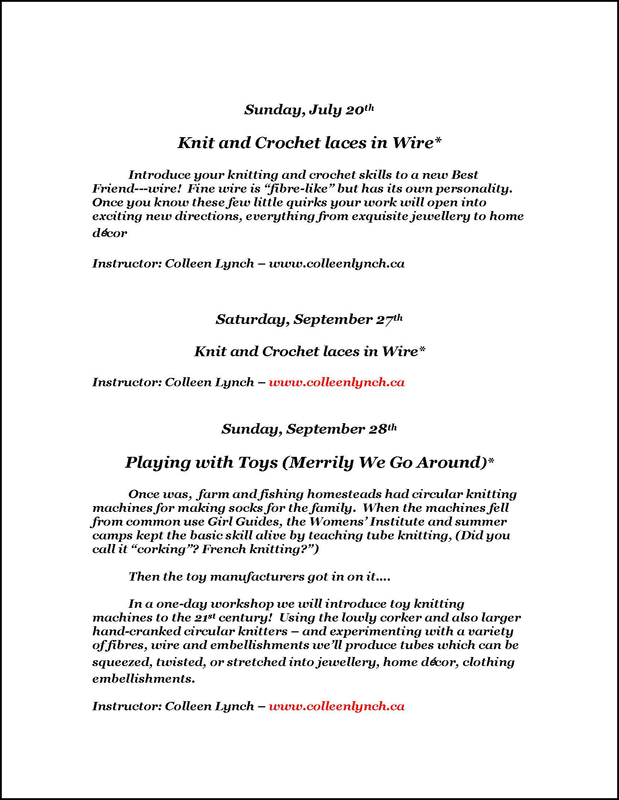 Workshop Registration: The workshop schedule is given in the handouts at the end of this post. 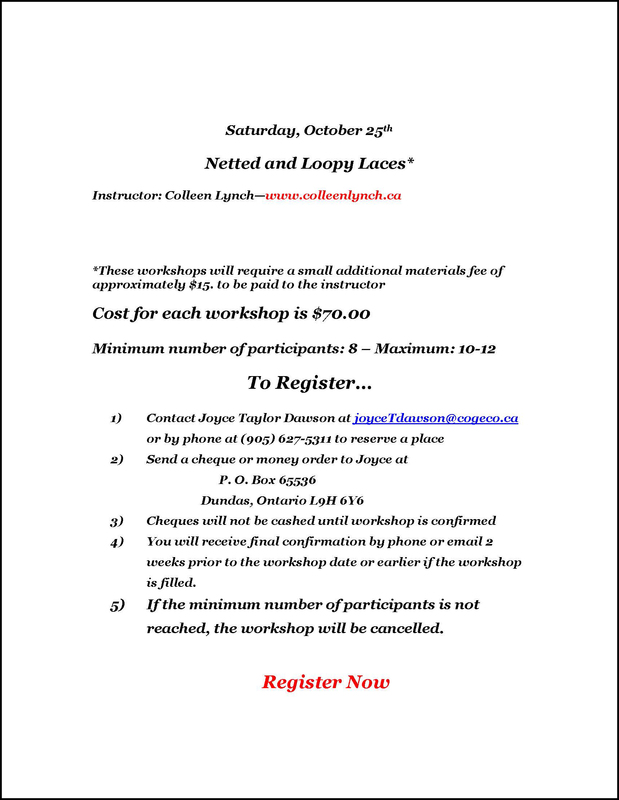 Contact Joyce Taylor Dawson, joyceTdawson@cogeco.ca, (905) 627-5311 to register. 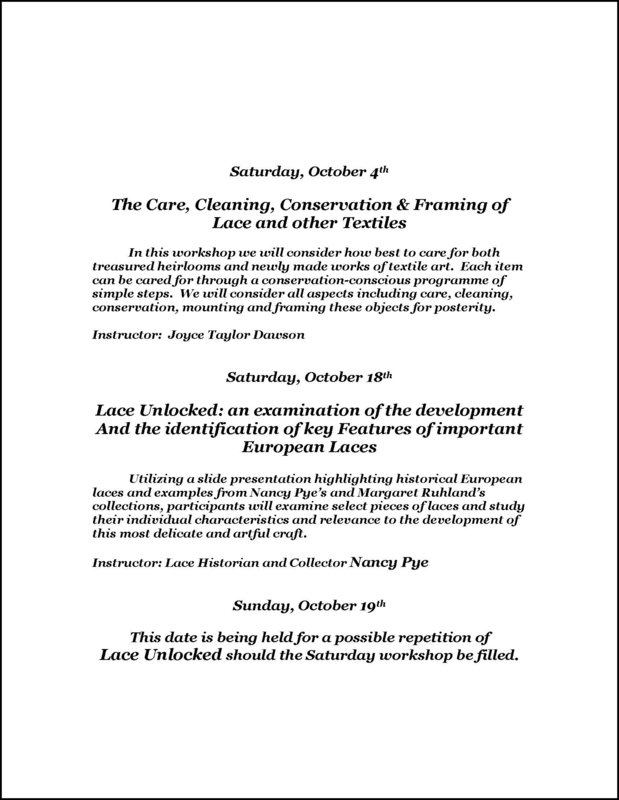 Instructors are lace experts Colleen Lynch, Joyce Taylor Dawson, and Nancy Pye. 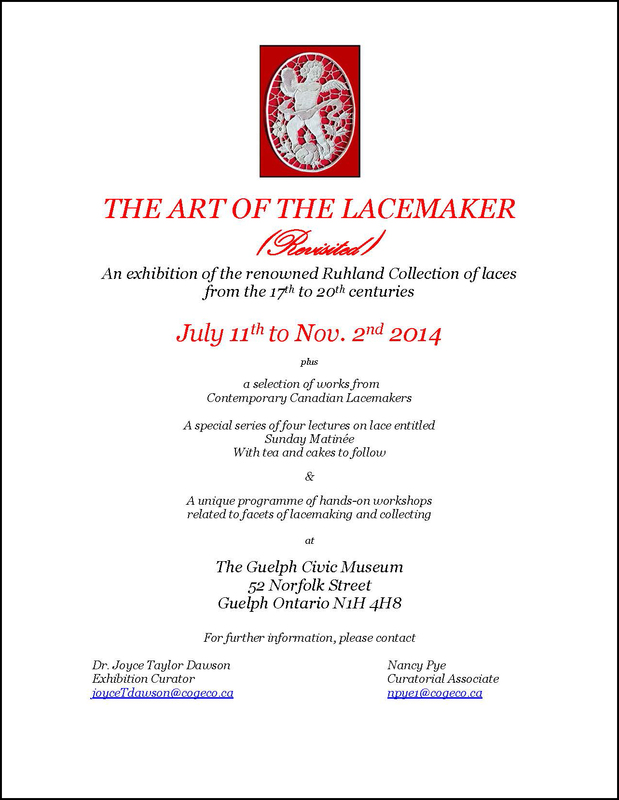 Margaret Ruhland had finalized arrangement for this exhibition with the Guelph Civic Museum shortly before she died unexpectedly in March 2013. My thanks to her close friend Dr. Joyce Taylor Dawson for these notes on Margaret and her collection. Ebayers may also recognize Margaret as the seller calicogre. 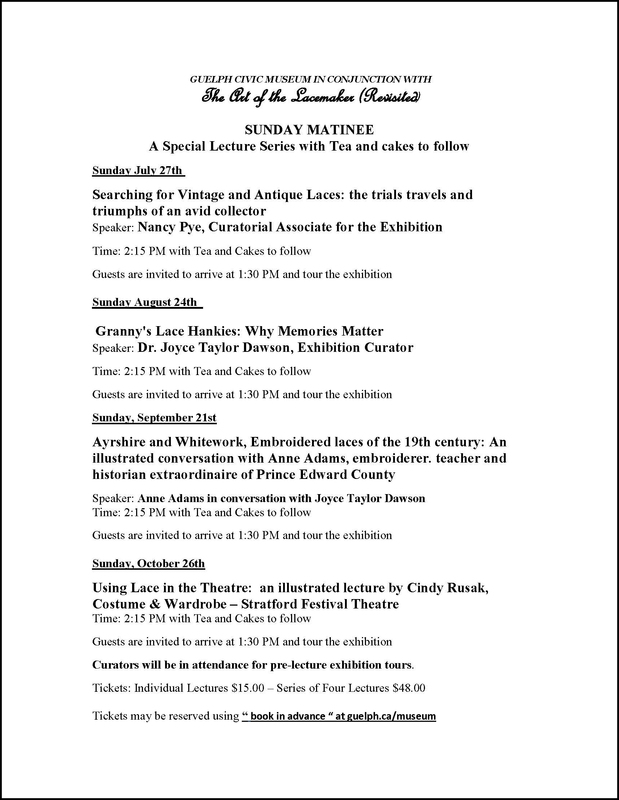 A woman of many talents and interests, Margaret Ruhland began collecting and studying lace in 1978 and quickly developed into one of Canada’s leading experts in the field. Her natural affinity for textiles and fashion, learned as a young girl in her native Holland, became an exceptional curiosity and interest in all facets of fibre arts. 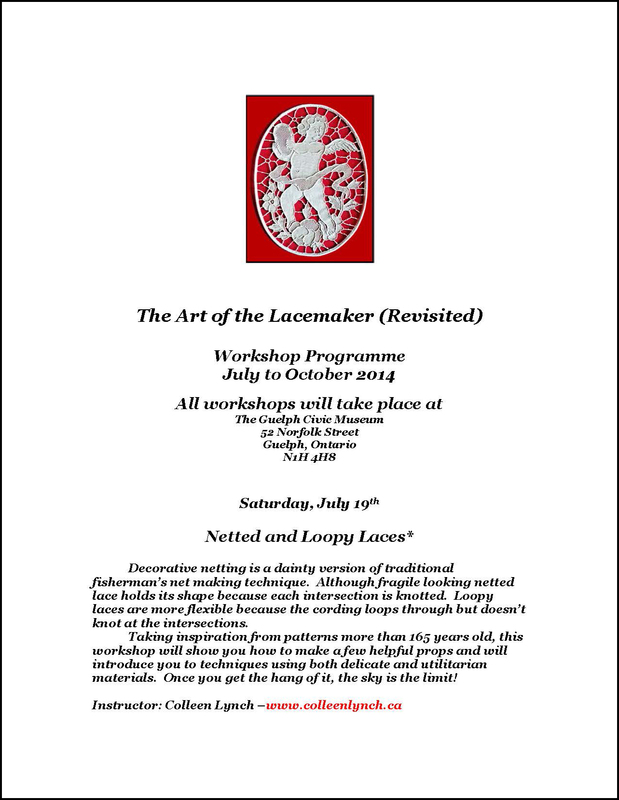 She was an accomplished weaver, embroiderer, needle lacemaker, and textile conservator. every one of its makers. Margaret’s goal, with each and every piece she gathered, was to produce a collection which would educate and create an understanding of the history and intricacies of lace. Until her recent and unexpected passing, Margaret’s creativity turned to hemp fashion designs and one of a kind jewellery pieces that allowed her to indulge her deep love of all things natural and won accolades for all of the works she created as a founding member of the artists’ group in the Grotto Artworks in Merrickville, Ontario. She will be sadly missed by all who had the pleasure of her friendship and the benefit of her great knowledge. 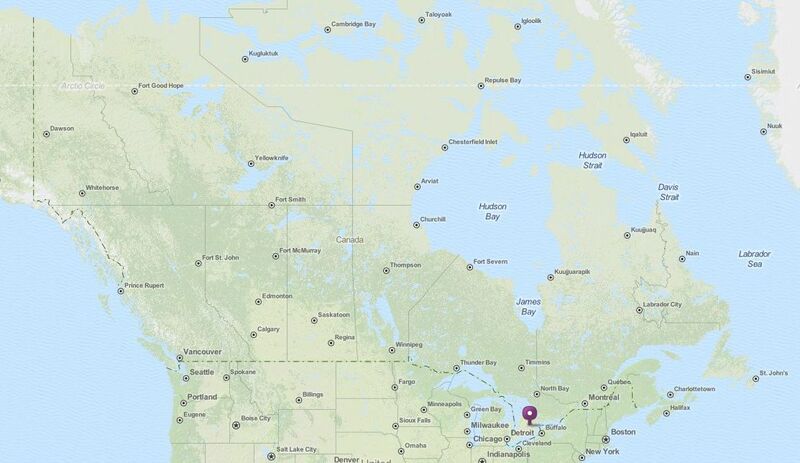 This entry was posted in Canada, Exhibitions, In Memorium. Bookmark the permalink.